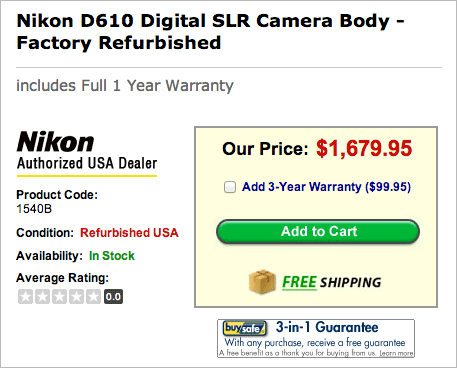 Another price drop: refurbished Nikon D610 cameras now sell for $1,679.95 with one year warranty (down from $1,749.95; new price: $1,896.95). A refurbished D610 with 24-85mm lens kit is listed for $1,949.95. They also have a nostalgic special: refurbished Nikon D3 for $1,999.95. See the full list of available refurbished Nikon gear at B&H, Adorama and Cameta Camera. This entry was posted in Nikon D610 and tagged Refurbished. Bookmark the permalink. Trackbacks are closed, but you can post a comment.